Miss Universe 2015 Pia Wurtzbach talks about her transition from beauty queen to traveling host, and how her latest projects are always close to her heart in the anniversary issue of Metro magazine out this month. Her reign as Miss Universe may be over, but Pia continues to take on new challenges and adventures with her return to film and to television in Metro Channel’s “Pia’s Postcards.” She also shares travel advice, pointing out essentials that accompany her wherever she goes. 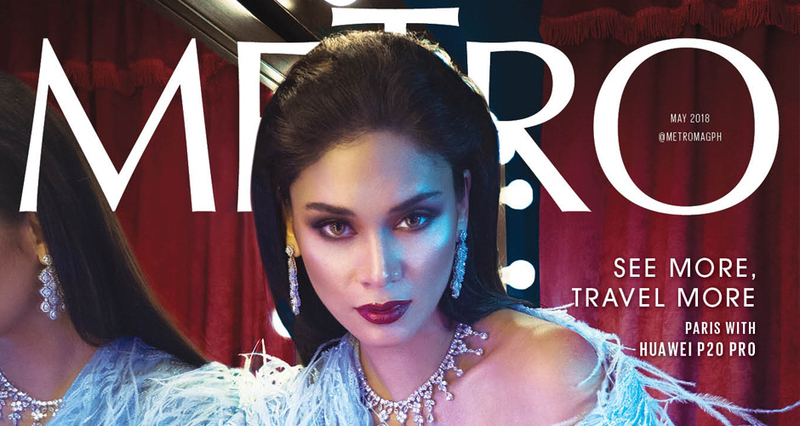 What makes this Metro May 2018 anniversary issue even more special is that all of Pia’s photos on the cover and inside the magazine pages were taken using a camera phone, the Huawei P20 Pro. Aside from Pia, Metro magazine is also proud to have on its cover the lovely mother-daughter pair, Gretchen Barretto and Dominique Cojuangco. Their cover photoshoot and cover story reveal a special kind of bonding between the two, one that is marked by strength amidst adversity, individuality, and the tremendous influence mothers have on their daughters. This limited edition is Metro magazine’s special Mother’s Day issue. On the beauty front, Metro brings readers up to speed on skincare buzzwords and the importance of double cleansing, alongside nail and brow trends to keep looking fresh and up to date. The magazine goes deeper in the latest “diet” that many celebs swear by, known as intermittent fasting. Metro also gives an inside look into the latest Rosa Clara collection, along with an exclusive interview the Senora herself. Readers may also check out the Tory Burch Spring/Summer 2018 pieces that will further heat up everyone’s summer wardrobe. Check out all these and more in the Metro May 2018 issue, now out in major bookstores and newsstands for P150.Do check out Metro.Style for more insights on the latest in beauty and fashion. For updates, follow @abscbnpr on Facebook, Twitter, and Instagram or visit www.abscbnpr.com. Previous ArticleOPPO F7 is now available in 9 month installments at 0% interest rate in Home Credit! Next Article LOOK: Oceans 8’s official poster!